Afternoon all and Merry Christmas! I am not sure if you have seen my previous topic which is a picture along with the theme "what if all eighties NYC films occurred in the same universe?" I am planning another one now but this time based on 1980's high school films / tv shows, what if they all occurred at the same school? Any glaring omissions? Obviously some actors / actresses are in multiple films so I have just focussed on my personal favourite. Ah yeah lite hope. good one! So many good ones listed here. I was thinking of 3 o'clock High when I first saw the topic. Also Summer School is a good one. I just realised that I never posted the final picture of this. Took a long time and I used the same artist as the NYC (see my other post). I wanted to seat all the people in groups based on their personalities and not with the people they starred with. The idea was that they were all friends with each other and the films just captured one specific event. For example Ferris Bueller is sitting with Zack Morris. The scene was going to be the fight in 3 O'clock high but it was difficult to place them all so we switched it to the end game in Teen Wolf. Wow that is totally awesome! Great concept and execution!!! Thanks, it took him about 2.5 months to do the painting and we did a lot of planning beforehand. That's some great stuff mrwistles!! 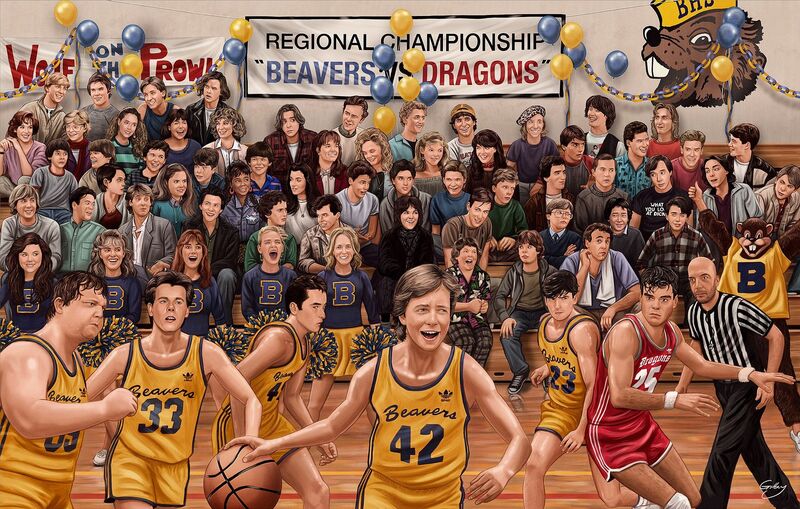 I recognize most but is that Judge Reinhold next to John Bender? And the 2 blonde cheerleaders, the 1 on the right looks familiar but cant place the 2 of them. Who Is the referee? Amazing talent. Hope to see more in the future. Yes that is Reinhold next to Bender. The cheerleaders (from left to right) are Tiffani Amber Thiessen, Elisabeth Shue, Kerri Green, Uma Thurman and I hope the one on the right doesn't look familiar as that is my wife! The ref is yours truly! Thanx for this list! All students have to know people for this list because they are legends! Also all students have to read this article http://articles.faithwriters.com/reprint-article-details.php?article=37854 that is about online homeschooling programs !